Starting: January 15th at 10.00am (UTC+1 timezone). Closing: February 15th at 5.30pm (UTC+1 timezone). Each Tutor will choose 10 Portfolios from their School’s participants to be submitted to the ISKO I-SKOOL™ Team by Feb 15th, 2019. Ten is the number of entries required from each School in order to become an ISKO I-SKOOL™ Partner. To help with the selection, from mid-January 2019 to early February 2019, the ISKO I-SKOOL™ Team will be available to analyze Designers’ Portfolios together with the Tutors, either personally or via Skype, based on availability. Starting from this 6th edition the Denim Design Award will be open not only to fashion design students in their final year of a Fashion Design Course (BA and MA) but also to Denim Design Professionals in the early stages of their career. They need to have graduated between 2014 and 2017 and should be no more than 27 years old. Denim Design Professionals must register directly and submit their Portfolios online, while sending the printed hard copy to the Creative Room offices (see 3.2), together with their completed and signed Entry Form and the INFORMATION ON PROCESSING OF PERSONAL DATA document. They will be evaluated by the ISKO I-SKOOL™ Team (mid-February 2019). 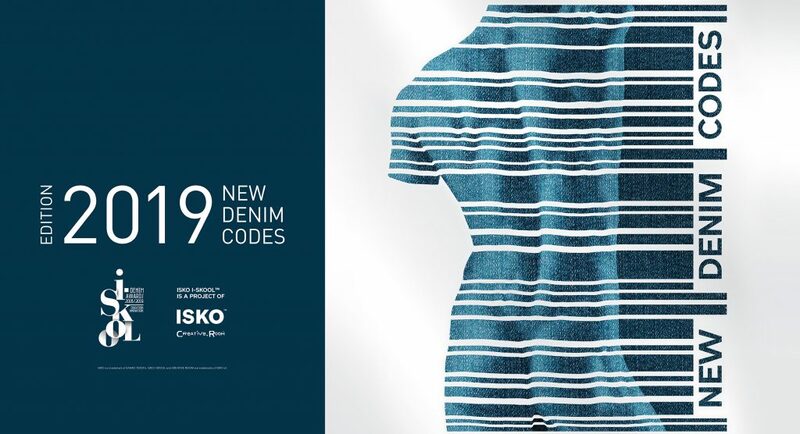 ISKO™ provides the students and Denim Design Professionals with a selection of its best avant-garde sustainable fabrics that applicants can explore and discover in advance consulting the “Fabrics Guide”. The Designers are asked to develop cutting-edge concepts following the creative guidelines outlined in the Creative Theme: New Denim Codes. Designers are asked to design a Capsule Collection made of six garments inspired by the Creative Theme and explain the reasons that led them to pick those particular fabrics. Participants are free to choose the reference season they prefer. Read the Guidelines section carefully and get ready to apply for the Denim Design Award.